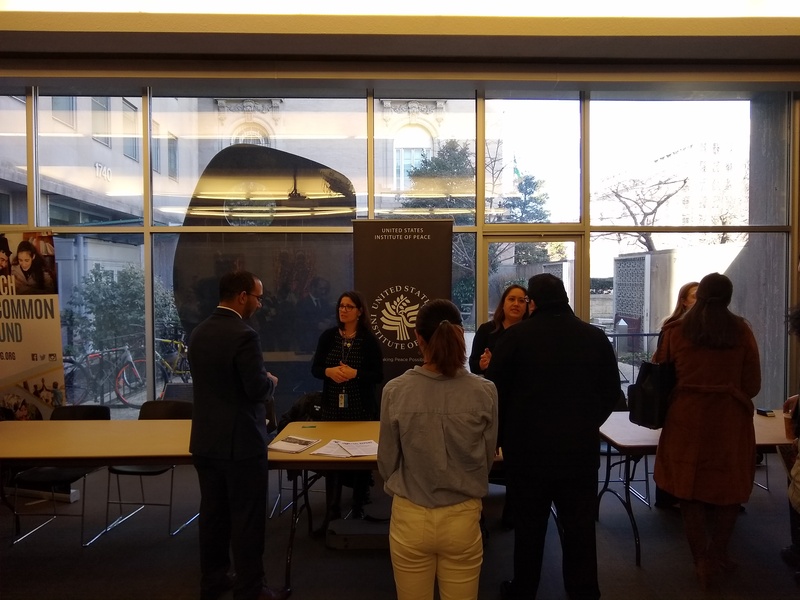 This morning (2/19/19) I was at the CPRF event on “Getting a Job in Peacebuilding” held at the School for Advanced International Studies at Johns Hopkins University (SAIS) in DC. CPRF is the Conflict Prevention and Resolution Forum. Members include Search for Common Ground, Alliance for Peacebuilding, George Mason University – School for Conflict Analysis and Resolution (S-CAR), Georgetown University – Conflict Resolution Program, Johns Hopkins University – Nitze School of Advanced International Studies – Conflict Management Program, and the U.S. Institute of Peace. I try to attend this event when it is held. Here is my blog from last June’s event. Lately, I have made it a practice of attending DC-based career fairs that focus on a range of international fields including peacebuilding, humanitarian assistance, development, security, and conflict resolution. At the end of January I attended the Society for International Development’s career fair at George Washington University. You can read my report of that event here. I was glad to see a few of my own S-CAR students at the event. I strongly encourage attending career fairs if you looking for work in the field. I’m about to start a Graduate Career Intensive Seminar at S-CAR, so for me, coming to this event was also my homework. The number of students (and those graduated) totaled about 75 or so. A good number, but in talking to the registration person, it seemed that many more had registered. The organizations in attendance included (all links are to the careers or jobs page): Freedom House, USIP, Search for Common Ground, Partners Global, International Center for Religion and Diplomacy, and Internews. Preparing for a career fair is important. A few of the students I met had business cards (yes, graduate students need business cards! ), but others did not have them or had forgotten to bring them. A rookie error. This piece on preparing for a career fair is helpful. I also recommend my 2-minute strategic share approach. The event started with a welcome from Dan Serwer, the director of the the academic director of the program at SAIS. I’ve known Dan for a number years dating back to when we were both at USIP. He set the tone for the program with some basic, and I thought, helpful advice. He mentioned that he had never hired someone because of their GPA and rarely because of courses they had taken. What is important to him is how the candidate can assist in what he (the employer) is trying to achieve. He recommended that students looking for work try to outperform: set themselves apart, bring unique perspectives, or develop sought after skill sets. My colleague from S-CAR, Agnieszka Paczynska, added about the importance of practical skills, not being afraid to start at the low rung of the ladder (you can work your way up! ), and taking advantage of the wealth of DC opportunities. All useful advice. Because I was familiar the groups there, I spent my time during the fair talking with students and those looking for work. I was happy to see, in addition my own S-CAR students, individuals I’ve worked with as a career coach and met at conferences (including the Peace and Justice Studies Association meeting in Philadelphia, and at the University of Massachusetts/Boston). I reconnected also with Mindy Reiser who is the vice-president at Global Peace Services USA. This group does some important peacebuilding work and his hosting an upcoming event on the Colombian peace process. So, get out and about! Don’t letter the winter weather or doldrums prevent you from networking (read my piece in the Fulbright Edge). David J. Smith is a career coach, speaker and consultant based in Rockville, Maryland, USA. He is the author of Peace Jobs: A Student’s Guide to Starting a Career Working for Peace(IAP 2016). He is an official member of Forbes Coaches Council and member of the PCDN Career Advisory Board. David is also the president of the Forage Center for Peacebuilding and Humanitarian Education, Inc. and teaches at School for Conflict Analysis and Resolution at George Mason University and the School of Education at Drexel University. He can be reached at davidjsmith@davidjsmithconsulting.com.